Hollywood’s Walk of Fame has a new star. Paul Rudd is on the Walk of Fame, and he deserves it. The star of Ant-Man was honored with a star on July 1st, 2015 in front of the historic El Capitan Theatre, and his co-star, Michael Douglas, and Ant-Man director, Peyton Reed, were on hand to celebrate the occasion. 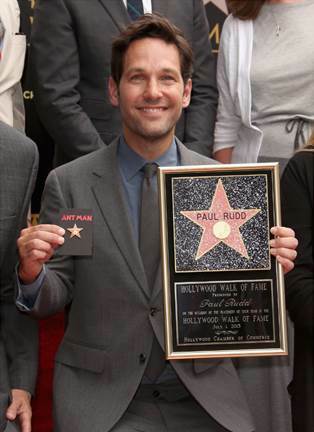 I think it’s about time Paul Rudd got a star on the Walk of Fame. He’s a great actor, making solid contributions to films such as Anchorman, This is 40, and, of course, Ant-Man. I like to think Ant-Man is what finally put him over the top. With Ant-Man, he showed us that he’s got more in his acting arsenal than funny faces and one-liners. He’s got solid dramatic skills, and he’s not too shabby in a fight, either. Ant-Man is the perfect film to showcase Paul Rudd in a different light. We’ve all gotten used to seeing him in comedic rolls. In fact, I can only think of one serious movie that he’s starred in. And while Ant-Man has its share of comedy thrown in, when you get down to it, it’s an action adventure super hero movie. Paul Rudd does an outstanding job in his role of Ant-Man, and he shows us that he can shine no matter what he’s doing. Ant-Man is in theaters everywhere July 17, 2015. See Paul Rudd, Michael Douglas, and Evangeline Lilly battle the forces of evil, using Ant-Man technology and paving the way for future Avenger’s appearances. From what I’ve seen, it’s going to be a winner, so get out there and see the film that I believe helped get Pual Rudd his own star on Hollywood’s Walk of Fame. This is going to be epic! This is going to be such a fun movie to go see in the theater! I like Paul Rudd, he is such a good actor and he will be fun to watch on the big screen! Paul Rudd is a great actor. this is going to be a lot of fun. It is about time Paul Rudd made the hollywood walk of fame star! Congrats to him! Great actor! Can’t wait to see his role in the Ant Man movie. Glad to hear this! He totally deserves it and I can’t wait to see this movie-it looks great!